OCZ Storage Solutions has revamped its solid-state drive (SSD) line-up since being acquired by Toshiba in January last year. The current consumer portfolio runs from the Arc 100 through to the Vector 180, sandwiching the Vertex and Radeon R7 drives in-between, and there's broad scope in terms of capacity and performance. Arguably the most important SSD is the entry-level Arc 100, because it's easier to convince users to switch to SSDs when cost becomes less of an issue, and OCZ sells the drive in 120GB, 240GB and 480GB models. It's no surprise to see the in-house dual-core Barefoot 3 controller powering the trio of Arc 100 drives. The eight-channel M10, also found on the Vertex 460A, is paired with Toshiba's common A19 MLC NAND. Sequential speeds are reasonable for the capacities, as are the random IOPS, though not as good as some of the newer competition. Part of the reason is that OCZ clocks the controller in at a lower speed than on, say, the Vertex 460, presumably for cost reasons. The budget origins also reveal themselves through a lack of power-loss protection on the hardware side and no accompanying cloning software in the package. The controller	has baked-in support for 256-bit AES encryption but there's no mention of TCG Opal or IEEE compliance meaning no support for Microsoft's eDrive - useful for businesses but not so relevant for the cost-conscious user. It's a shame that the only form factor available is the standard 2.5in, 7mm common for SATA drives in larger laptops and PCs. The nascent rise of M.2 and even mSATA would increase the scope of the Arc 100 by a substantial degree. Drive longevity is measured in the total number of writes per day. 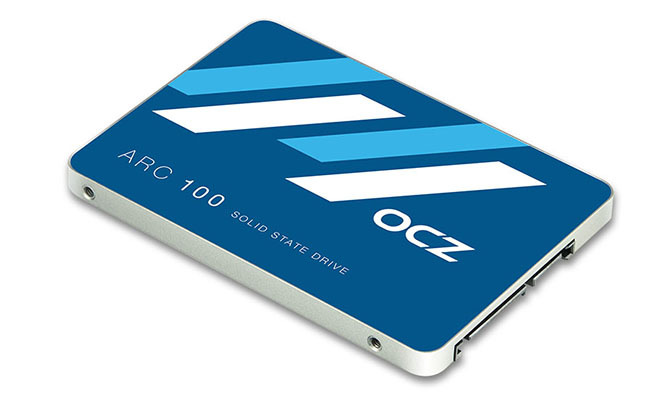 Over the course of the three-year warranty OCZ says you can write 20GB per day. That doesn't sound like a lot at first glance, but most client users won't approach that on a regular basis for what will presumably be a boot drive. Competition such as the Crucial BX100 offers more robust longevity, mind, with 40GB per day over a five-year period, or 72TB TBW. But the warranty is better than it may seem at first glance. What this means in practice is that OCZ issues the cover based on the drive's serial number rather than tie it in with the original purchaser or receipt. The company goes further to say that any defective drive will be replaced by a brand-new model. Advanced product replacement is also a feature, where a new drive is dispatched before the presumed defective model is sent back to OCZ on a prepaid label. In short, the warranty is impressive, and we feel that the company has to offer competition-beating performance and warranty terms due to a previous history of admittedly sub-standard service. Inside, it's standard fare on the 240GB model we have in for review. Each of the 32GB chips is composed of four 8GB dies, totalling 256GB, with OCZ leaving a little spare room for overprovisioning. Drive monitoring and firmware upgrades are taken care of by the new SSD Guru software, and we had no trouble in updating the drive to version 1.01 before testing. Pricing for mid-capacity SSDs continues to become more impressive month on month, with a 240GB model available for £65 and a 480GB for £130. Such pricing puts the OCZ Arc 100 close to the aforementioned Crucial BX100, for example, so let's see how the performance plays out.